While my cookies turned out to be delicious (I’ve already plowed through about half the batch) I wanted to show you the dark and dangerous realities of cookie baking. 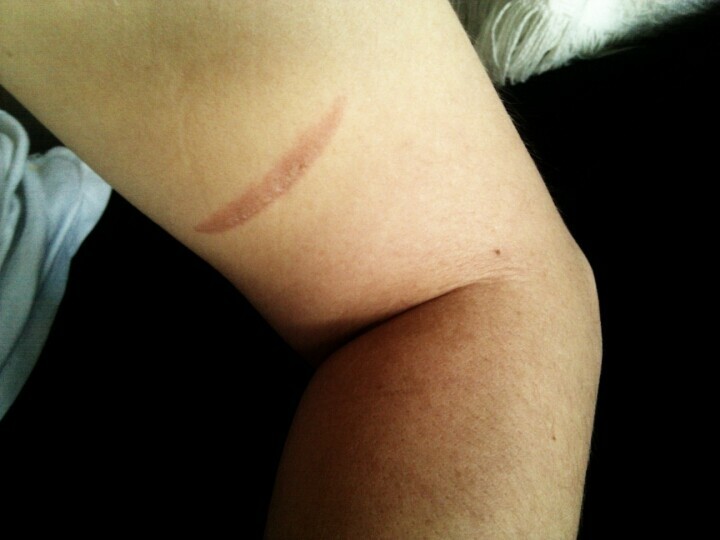 While taking out my second batch from the oven, I was distracted by Tabatha’s Salon Takeover and accidentally burned my bicep with the scalding hot cookie sheet (see picture below). It turned out to be quite a large battle wound. Now all I need to do is think of a better story that will make me look like more of a badass and less like a nincompoop. You MUST refrigerate the dough for at least 8 hours, although 24 hours is preferred. This is crucial. After plopping the dough balls onto the cookie sheet, add a little bit of sea salt to the tops. This gives a nice sweet and savory dynamic. (Note: only do this if you use unsalted butter). Bake the cookies for 8 minutes at 350 degrees. They may still look uncooked when you take them out, but they will continue to bake once you take them out. The better the quality of the chocolate chip, the better the cookie. I recommend Ghiradelli semi-sweet chips. These can be found at any major grocery store. All these tips combined will bake some badass cookies that are sure to be the most popular at any party. Sandwich some ice cream in between or dip them into some chilled almond milk. Chocolate chip cookies will forever and always be my favorite cookie. More baking tid-bits coming soon!